Selective Hearing, Younger Dreams, and Oak Island EP All out now! We are heading out this Spring with our friends in State Champs, The Dangerous Summer, and Grayscale as well as a few select headlining shows. Tickets are on sale now and going fast. Pick up yours before its too late! The music is phenomenal by far, but my biggest appreciation for OLN is their integrity. They don’t record music for the fame or the money. They are fulfilling their dreams and remaining true to themselves. This is glaringly obvious in everything from their live shows to their smoothie challenge/jock jams/dozens of other YouTube videos, even down to their personalities. Put simply, this is just a group of guys having an enjoyable time doing what they love. Their music style is unmatched and their lyrics resonate so profoundly. Kickass bunch of guys, sensational concert. Please put tickets up for grabs for November, very eager to come rock out again!! I wish I could post more than one photo, but this was my very first concert and I was not disappointed. Seriously love this band with every fiber of my being. They put out quality music and they love making it too! You can tell that they do by the energy they bring on stage and the atmosphere just changes. I will be definitely be going to see them in November! We had an amazing time! 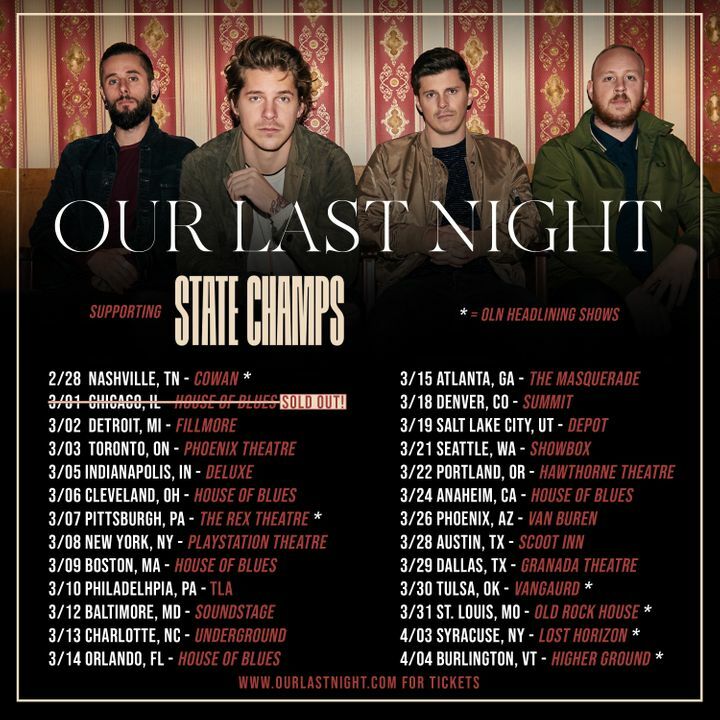 Greyscale, The Dangerous Summer, Our Last Night and state Champs we all great. The sound and lighting was done very well. 10/10 Love OLN and will definately see them again!